In a new, thought-provoking paper today in Nature, Shoukhrat Mitalipov and a multi-institutional team report a significant advance toward potential novel ways to treat mitochondrial diseases. Mitochondrial diseases are rare, but devastating disorders caused by genetic mutations. Today they are largely impossible to treat in meaningful ways other than palliative care. Some of the mutations causing these diseases are in nuclear DNA, while others are in the mitochondrial DNA (mtDNA). The main current approach to prevention is preimplantation genetic diagnosis (PGD) to select for embryos following IVF that lack or have low levels of the mitochondrial disease-associated mutations. This can often work quite well, but for others it only works poorly and it is not an option at all for some women. Other options include to obtain a donor oocyte or adoption, but some women understandably want to have their child be genetically related to them. Clearly new approaches to prevention and treatment are needed. One idea that has been much on the radar of late is so-called three-parent IVF (aka “mitochondrial transfer” even though no mitochondria are transferred). The UK has approved the future use of three-person IVF, but it remains unavailable for now in the US pending continued review by the FDA. Mitalipov is also pursuing three-person IVF approaches including via a collaboration in China, where it appears the technology is permitted for use in humans. In the new research reported today, Mitalipov again tackles mitochondrial diseases, but from an intriguing, different angle: the use of stem cell-based regenerative medicine. In this paper, entitled, “Metabolic rescue in pluripotent cells from patients with mtDNA disease”, the team reports that they can reverse mitochondrial disease via reprogramming to produce induced pluripotent stem cells (IPSCs) or via somatic cell nuclear transfer (SCNT; also known as “therapeutic cloning”), a method distinct but with some similarities to that which is also used in three-person IVF. Notably, the team also includes scientists from the lab of Juan Carlos Izpisua Belmonte, who recently published a study on potential gene-correction-based methods to prevent mitochondrial disease through germline interventions. Both via IPSC formation and through SCNT, the team reported being able to create pluripotent stem cells (PSC) with few-to-none mutant mitochondria detectable. The approach was based on using parental fibroblasts from mitochondrial disease patients. These patients’ cells have simultaneously two different kinds of mitochondrial mutations associated with disease syndromes: mitochondrial encephalomyopathy with lactic acidosis and stroke-like episodes (MELAS) and Leigh Syndrome. Keep in mind that these patients have a mixture of wildtype (WT) and mutant mitochondria in each single, individual cell, a condition called “heteroplasmy”. Intriguingly, the resulting patient IPSCs (each clonally produced from a single patient fibroblast cell) exhibited segregation of the WT and diseased mitochondria. As a result, what this means is that some of the separate IPSC lines were largely or entirely non-heteroplasmic, while others were entirely mutant. Very cool. It’s important to point out that in 2013, a team lead by Timothy J. Nelson reported this same kind of mitochondrial segregation phenomenon during IPSC formation in a Stem Cells paper. The Nelson team also suggested in that 2013 paper (FOLMES, et al.) that this approach could be used for cell-based regenerative medicine therapies as well. The new Mitalipov group paper builds substantially on this earlier Nelson finding and extends it to include SCNT. How is this remarkable type of mitochondrial segregation possible if individual cells each contain thousands or tens of thousands of mitochondria, and in the case of heteroplasmy presumably the WT and mutant mitochondria are all mixed together in the cell cytoplasm in a jumble? While the precise cellular mechanism remains to be proven, the authors indicate that this heteroplasmic segregation often occurs in the fibroblasts prior to production of IPSC. Apparently as the fibroblasts were proliferating prior to reprogramming they in some cases spontaneously segregated their mutant and WT mitochondria into different daughter cells. The proposed result of this phenomenon is that the fibroblasts cultures in some cases contained just three main subtypes of cells: heteroplasmic, mostly or entirely containing WT mtDNA, and mostly or entirely containing mutant mtDNA. Then after reprogramming, which generates clonal IPSC colonies, this segregation phenomenon was present in the stem cells. The big, exciting takeaway message from this segregation data is that in principle this approach of making IPSC from patients suffering from mitochondrial disease could be used to produce patient-specific IPSC that contain mostly or entirely WT mitochondria. In turn, those “fixed” IPSC could be used for regenerative medicine therapies in these patients via transplantation. The paper also reports mitochondrial correction via SCNT where nuclei are transferred into healthy donor oocytes that have had their own nuclei removed. The donor oocytes contain WT mitochondria. The new hybrid oocytes, now hopefully containing few if any residual mutant mitochondria, can then be used to produce nuclear transfer embryonic stem cells (NT-ESC). For both the NT-ESCs and the IPSCs containing no detectable mutant mtDNA, the paper reports the cells exhibit a correction of mitochondrial-disease associated cellular metabolic defects. This functional correction is encouraging from a potential future therapeutic perspective. A few open questions remain for future studies. I’m very curious to know if this spontaneous segregation of WT and mutant mitochondria also happens inside of patients with mitochondrial diseases. In other words, do some of their cells become WT and some become entirely mutant? If some adult stem cells already present in patients can be identified and amplified that would represent another potential source of cells for therapies, which wouldn’t require reprogramming. Also, they show that a few hundred genes in the NT-ESC and IPSC still exhibit altered gene expression compared to controls (this is from transcriptomic analysis and note that they also did mitochondrial transcriptomic analysis; Extended Data Figure 7 shown at top of the post shows those results, comparing the different cell lines). What could be the meaning of these expression changes? I also would be interested to see more data on the epigenetic effects/phenotypes of the different kinds of cells in this paper. For instance, what are the epigenetic states of the different kinds of IPSC with either mutant or WT mitochondria predominating? How do these compare to the parental fibroblasts and to control cells lacking mitochondrial mutations? Another issue that arose in the paper points to the challenges with making NT-ESC. One of the two NT-ESC lines produced, NT2, exhibited failed enucleation. This means that although the researchers thought that they had removed the donor oocyte’s own nucleus before transferring in the somatic cell nucleus, they had in fact not successfully done so. So they ended up with an oocyte with two nuclei’s worth of DNA from both the oocyte donor and the somatic cell. As a result, the NT2 line was genetically abnormally as it was tetraploid (having four sets of chromosomes). Such a line could not be used therapeutically. Even so, with proper validation and screening such lines in the future could be avoided and the focus could be on genetically normal cells that are produced. This all highlights the importance of validation and genomic screening. In that regard, it would have been of interest both for the NT cells and the IPSC to see whole genome sequencing data or at least whole exome sequencing to check for mutations. 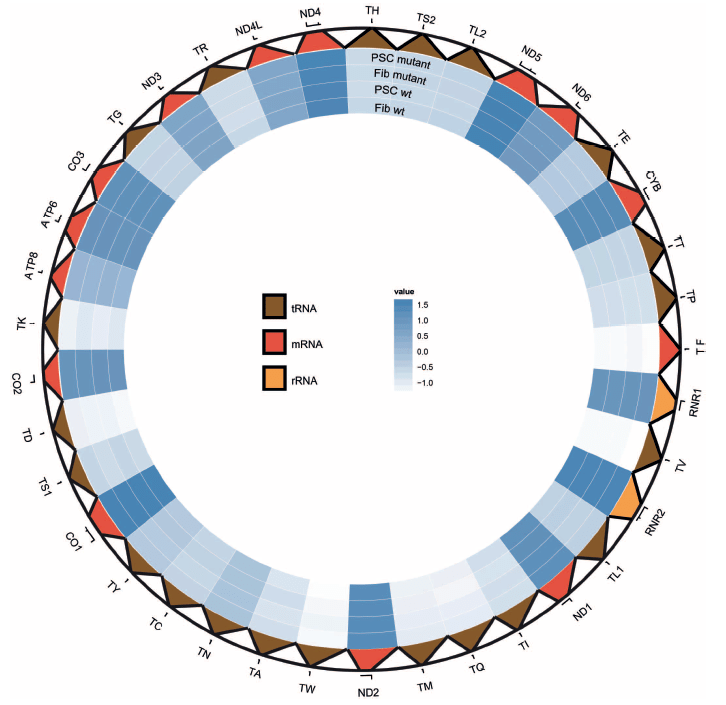 The authors’ efforts in this area were limited to whole mitochondrial exome sequencing. There’s also still the question of whether SCNT can realistically remain a therapeutic option when reprogramming to make iPSC so far seems to work just as well and be far simpler. Overall, this is a notable new paper that takes cutting edge technology and runs with it in some creative ways. There is also another potential approach to mitochondrial disease – expression of the mitochondrial genes in the cell nucleus, with transfer of the resulting mRNA to the surface of the mitochondria for translation into mitochondrial proteins. This approach seemed to fail in the past because the 13 proteins encoded in the mtDNA are very hydrophobic and would curl up before reaching the mitochondria, but taging the mRNA so that it reaches the mitochondrial surface before being translated seems to overcome this problem (at least for ND4). I’ve been told that mitochondrial disease manifests in cell types that are highly energetic and long lived (muscle cells, neurons etc). The main advantage of this approach is that it can do something for individuals already born. It may turn out to be cheaper than three person IVF or creating mitochondrial mutant free iPSCs. Following on from Jim’s comments, can anyone shed a light on what exactly was regulated in the UK approval? For example is it only allowed to replace whole “unmodified mitochondria” (e.g.from individuals without the disease causing genetic lesion) or can the mitochondria be genetically altered before use? Could these methods be used as delivery vehicles for introducing modified germline sequences or even new genes or was that explicitly excluded? No specific gene editing is allowed in UK. Only all mitochondria. This can be attempted through nuclear, spindle, or polar body transfer. So mom-to-be’s nuclear genome gets put into donor egg that has had its own nucleus removed. New hybrid oocyte has mom-to-be’s nuclear genome, but rest of egg including the mitochondria collectively come from donor. Because cellular “stuff” is sticky, some tiny bit of mutant mitochondria come along for the ride with the nuclear genome, but hope is that this is so small in amount that the mitochondrial disease will have been prevented. The heteroplasmy story is fascinating and I’m excited to learn what mechanism evolved to do that – and why? Thanks for the comment, Jim. That approach is interesting. The more that people research and come up with creative ideas, the stronger the likelihood of success. I’d favor non-genetic modification approaches to mito diseases as opposed to three-person IVF (aka three-parent babies). @Muggles, I agree. I still do not quite get how heteroplasmy segregation could happen so efficiently. I suspect there are still mutant mitochondria in some of those IPSC lines, but not many. I’d like to see longer term culture to check if those remaining undetectable mutant mitochondria could have a selective advantage and make a reappearance later. After all we are talking about stem cell transplants for these patients and they would live with such cells forever.